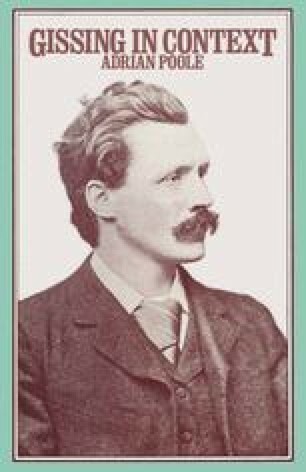 The Nether World (1889) is the last and most successful of Gissing’s early attempts to dramatise on a large scale the problems of energy, need and relationship in the context of extreme urban deprivation. Gissing did some careful research in Clerkenwell for this novel. His Diary shows him going over ‘a die-sinker’s place’, for example, and getting ‘useful ideas’.1 Yet these rarely emerge in physical details in the novel, as they had done to a great extent in Thyrza, and would certainly have done in Zola. The value and stature of this novel is to be found in its articulation of the quality of human desire and suffering beneath the differences of class and individual personality. In this it is more successful than any strictly ‘documentary’ approach could be; Booth’s investigations offer a sharp and pertinent comparison.